Hitting a friend. Pulling the dog’s tail. Running across the street without you. These are typical moments that all come down to one thing: self-control, and toddlers’ lack of it. Expecting more from children than they are capable of can lead to lots of frustration and stress for both parents and children. Findings from a major research endeavor, Tuning In — conducted by Zero to Three and The Bezos Family Foundation — revealed that thousands of parents of children five years and younger overestimate toddlers’ ability for self-control. Brain research shows that these skills start developing between 3.5 and 4 years, and take many more years to be used consistently. 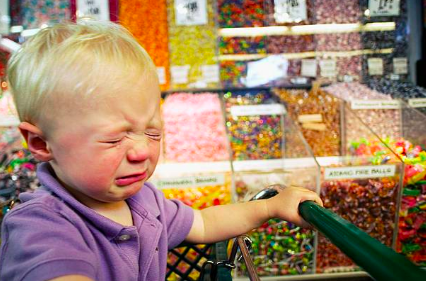 Why do young children have so little self-control? The part of the brain responsible for exerting control over the emotional, impulsive part is not well developed in children under three. This is why toddlers are much more likely to act on their desires, such as yanking a toy out of a friend’s hand, rather than ask nicely for a turn. Remember too that being able to recite a rule — “Hands are not for hitting” — is not the same as being able to follow it. Clever, verbal two-year-olds make it easy for parents to have an “expectation gap” since they seem to understand so much. But life with your toddler will be more joyful and less maddening when your expectations are in line with his abilities — when you see that your child is acting his age, and that he needs help to learn to manage his impulses. He is not purposefully trying to drive you crazy, as much as it may feel that way. Recognize that it‘s not easy being a toddler. Let your child know you understand: “You’re really disappointed that we can’t go to the playground today.” “You’re mad that I won’t let you have ice cream before dinner. I totally get that.” Giving your child the words to describe his feelings is the first step toward helping him manage his emotions and developing self-control. Play games that require impulse control. Color one side of a paper plate red and the other green, and play some “stop and go” games. Hold up the green sign and let her run. Then turn to the red side and wait for her to stop. Play “freeze dance” with music. When the music is on, your child dances; when you stop it, she has to freeze. Play “Simon -says,” “Duck-duck-goose,” or any game that requires waiting or stopping. Use pretend to practice self-control. When a stuffed animal gets really mad or does something it shouldn’t, problem-solve how “Mr. Bear” might deal differently with the challenge he’s facing. Set appropriate limits with natural consequences. Even though your child may not be able to follow a rule yet, it is still important to set a few simple family rules. Look at it as an important way of teaching and guiding your child. Stay calm and explain the rule (“No throwing toys. If you throw the truck, I will have to put it away”). If your child tests the limit, calmly implement a natural, age-appropriate consequence, like taking away an object that he is misusing. Through everyday interactions like these, children develop the brain connections they need to master the skill of self-control. Take your own temperature. As a parent, you have a lot of power. Your child is taking his cues from you when it comes to managing emotions. Learning to manage and make sense of your own feelings — and getting help when you need it (and we all do) — is the best way to help your child develop self-control. Responding thoughtfully, rather than reacting, is one important way that parents support their children’s healthy development. Summarized from an article by Claire Lerner and Rebecca Parlakian – Zero to Three.